The "Building Code Requirements for Structural Concrete" ("Code") covers the materials, design, and construction of structural concrete used in buildings and where applicable in nonbuilding structures. The Code also covers the strength evaluation of existing concrete structures. Among the subjects covered are: drawings and specifications; inspection; materials; durability requirements; concrete quality, mixing, and placing; formwork; embedded pipes; construction joints; reinforcement details; analysis and design; strength and serviceability; flexural and axial loads; shear and torsion; development and splices of reinforcement; slab systems; walls; footings; precast concrete; composite flexural members; prestressed concrete; shells and folded plate members; strength evaluation of existing structures; provisions for seismic design; structural plain concrete; strut-and-tie modeling in Appendix A; alternative design provisions in Appendix B; alternative load and strength reduction factors in Appendix C; and anchoring to concrete in Appendix D.
The quality and testing of materials used in construction are covered by reference to the appropriate ASTM standard specifications. 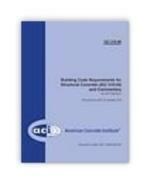 Welding of reinforcement is covered by reference to the appropriate AWS standard. Uses of the Code include adoption by reference in general building codes, and earlier editions have been widely used in this manner. The Code is written in a format that allows such reference without change to its language. Therefore, background details or suggestions for carrying out the requirements or intent of the Code portion cannot be included. The Commentary is provided for this purpose. Some of the considerations of the committee in developing the Code portion are discussed within the Commentary, with emphasis given to the explanation of new or revised provisions. Much of the research data referenced in preparing the Code is cited for the user desiring to study individual questions in greater detail. Other documents that provide suggestions for carrying out the requirements of the Code are also cited. 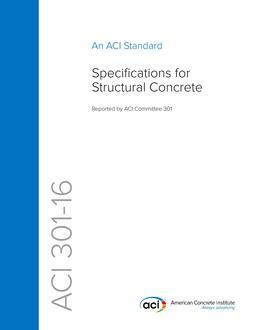 This edition of the ACI Building Code is deemed to satisfy the International Organization for Standardization (ISO) 19338:2007, Performance Assessment Requirements for Design Standards on Structural Concrete.